Oxford Bookworms 4. Three Men in a Boat CD Pack por Jerome, Jerome K.
‘I like work. I find it interesting . . . I can sit and look at it for hours.’ With ideas like this, perhaps it is not a good idea to spend a holiday taking a boat trip up the River Thames. But this is what the three friends – and Montmorency the dog – decide to do. It is the sort of holiday that is fun to remember afterwards, but not so much fun to wake up to early on a cold, wet morning. This famous book has made people laugh all over the world for a hundred years . . . and they are still laughing. Jerome K. Jerome (Jerome Klapka), va néixer a Walsall (Staffordshire) el 1859, i va morir a Northampton (Northamptonshire) el 1927. Va publicar el seu primer llibre el 1885 (On the Stage?and Off), però va ser amb Tres homes en una barca (1889; Quaderns Crema, 2000) i The Idle Thoughts of an Idle Fellow (1886) que va adquirir fama mundial. 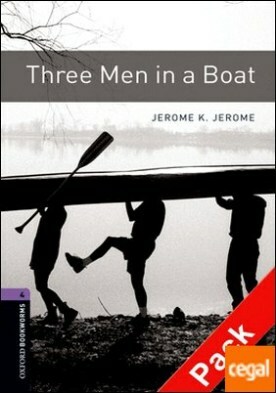 THREE MEN IN A BOAT (STAGE 4) por JEROME, JEROME K.